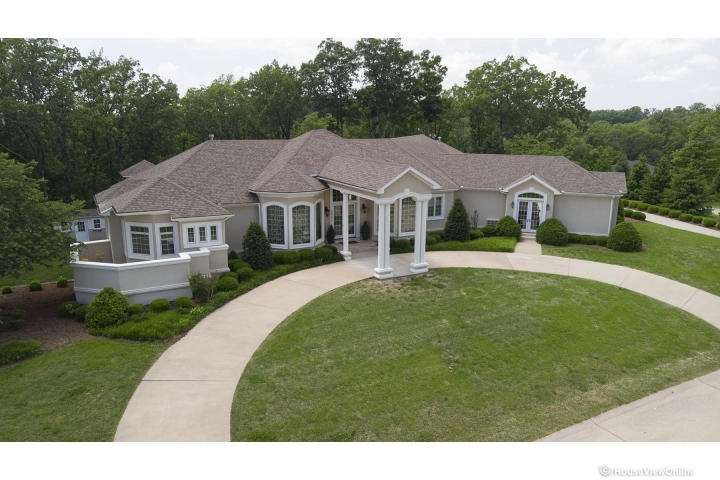 Stunning, one of a kind custom home! This designer European style ranch is offered below appraisal! There are so many outstanding amenities in this 5 bedrooms, 4 full plus 2 half bath home. The entry has a circle drive with Porte-Cochere that is separate from the garage drive and entry. The main level has volume ceilings and an abundance of full length Pella windows to take in the view of the "resort" like back yard with inground pool, 2 lanai's wet bar and all surrounded with Travertine marble. The kitchen is expansive with custom cabinetry, all Viking appliances and full prep island. The family room opens to the kitchen and the entire area opens to the pool area. The master bath is completed with a steam shower and 2 walk in closets with custom built-ins. The other 2 bedrooms on the main level each have their own bath. The basement complete this home with a huge family room, media center, 2 bedrooms, and a bath and half. The home sits on a 1.51 acre treed lot and gives much privacy.